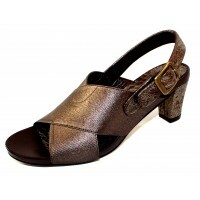 Crossband sandal with adjustable halter backstrap. Adjustable buckle. Leather linings and leather padded insole. Leather sole. 2 1/2 inch black patent croco leather wrapped heel. Made in Spain.